The forthcoming centenary is likely to provoke a great deal of interest in the First World War from those with little or no prior knowledge about it, and whilst there are literally hundreds of books about the conflict to choose from, for the first time reader it can be difficult to know where to start to find that elusive bit information that may help shed light on their ancestor’s war service. Given the nature and scope of the war, many books are particularly specialist or focus primarily on a battle, campaign, or regiment. Having a conflict with so many facets to study means that it can be difficult to find sources of key information all in one place. 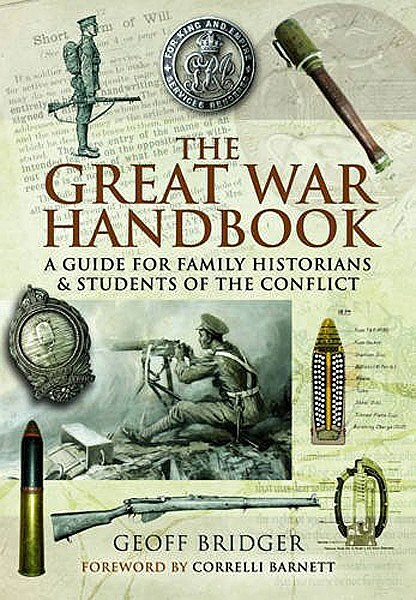 The Great War Handbook seeks to redress this by providing a useful reference tool covering a number of areas. The book is not a narrative of the war (although a chronology of major battles is given), but provides an overview of topics such as the structure of the army, enlistment and service, equipment and weapons, life in the trenches, and the casualty evacuation process. There are also two short chapters on visiting the battlefields and carrying out research. The book contains a wealth of information on a diverse range of topics within its 200 pages. The only problem with this approach is that some topics are barely touched on due to the amount of information covered in a relatively short publication. For example the section on underage enlistment gives some basic information about this area but does not actually inform the reader what the minimum age for enlistment was. Some aspects of the war are particularly complex and cannot be comprehensively covered in a couple of paragraphs. Pointers to further sources of information for each chapter would have been useful, however the bibliography is sparse and personally I would have liked to have seen more references giving the sources of the facts and figures that are presented. However, despite these minor shortcomings The Great War Handbook does an excellent job of bringing together concise explanations of a number of key areas. It always amazes me just how much there is to learn about the war, and novice and seasoned researchers alike will find something of interest here, and I know it is a book I will continue to refer to in the future.